Outreach is a buzzword that gets thrown around a lot and you may have heard it. It means the act of extending services to those who might not have access to them. A key component of outreach is that the organizations providing services meet those in need of the services at the locations where those in need are. And to see outreach in action, come to Pete’s Place. 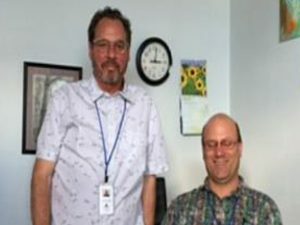 Avrum “Av” Golenberg and Quill Head are outreach specialists with The Life Link, an ICS Provider Partner whose programs focus on housing , mental health and substance abuse. The Life Link was able to place Av and Quill at ICS through a grant provided by the Projects for Assistance in Transition from Homelessness (PATH), a program of the Substance Abuse and Mental Health Services Administration. They have had an office at ICS since mid-summer, but you are more likely to find Av and Quill in the dining hall or out on the patio talking to guests, asking questions and developing relationships based on trust. “It’s this person to person contact where we can learn about the guest’s needs – what is the situation that brought them here,” Av said. It’s a triage situation by asking questions and then listening to the answers. Quill and Av employ motivational interviewing, a method of asking questions that is client-centered and directive toward highlighting the personal motivation to change. The questions explore a guest’s uncertainty or ambivalence and help resolve their steps toward change. It respectfully addresses the guest’s issues without hard confrontation. When an individual is ready to address his or her situation and move towards a goal, Av and Quill are able to refer them to the agency or organization that can help. “We don’t just refer people to Life Link,” Quill said. “We send them to the provider that offers the services they need whether it’s Healthcare for the Homeless, the VA, Southwest CARE, or PMS.” Other ICS Provider Partners also include Santa Fe Community Services, St. Elizabeth Shelter, Street Homeless Animal Project/Pet Care, Food Depot, Youth Shelter, Goodwill Industries, Legal Clinic, and Homeless Court. “It’s important to honor the wishes of a guest,” Quill said. “When they are ready to take the steps to deal with their sometimes overwhelming situations, we are there to accompany them to the service agencies that can help them.” And “accompany them” means not just handing a referral card and sending them out the door. If the guest wants it, Av or Quill will drive them to the agency or make sure the guest has a bus pass and directions. It always means following up with the individual to let them know Av and Quill – and Pete’s Place – is there for them.